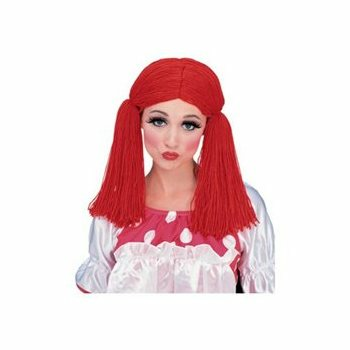 No rag doll costume can go without this Womens Red Rag Doll Wig! This familiar deep red wig made with beautiful yarn fiber will go perfectly with your costume, and have everyone's eyes on how adorable you'll look this Halloween, whether you're going as Raggedy Ann or Pippi Longstocking! Combined with your absolutely gorgeous costume, this wig will provide the finishing touch you need! If you need a better grip with this wig, combine your Womens Red Rag Doll Wig with a Wig Cap to keep your hair concealed, secure and comfortable!